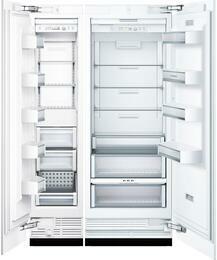 The Bosch Benchmark built in refrigerators are energy star certified, which saves on energy as well as costs. The 30” Bosch benchmark comes in panel ready and stainless steel equipped with dual evaporator systems preventing odor transfer and optimize freshness. The dual compressor system is a dedicated cooling system responsible for each compartment. 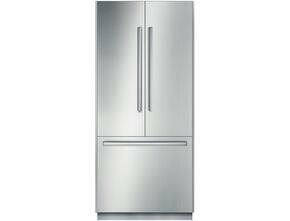 The refrigerator offers a variety of designs such as french door and panel ready customizing to your kitchen needs. The optiflex hinges are designed to open out and away from cabinetry. It’s a hinge construction that allows doors to be mounted flush, yet open to a full 115°, without touching or marring surrounding cabinets. Inside, you'll find two adjustable glass shelves, three door bins including one with gallon storage, a humidity controlled crisper drawer for the preservation of produce and a deli drawer for the preservation of meats and cheeses. In the freezer, there are two drawers for storage and an ice maker that filters water for consistently fresh, clean ice. A generous 16 cu. ft. of total interior capacity gives you the space to store weeks' worth of food items in this refrigerator. This unit has an automatic defrosts system for low maintenance operation and is sabbath mode capable.